My husband...in trying to be sweet...served tea on an antique tole tray and the teapot left a milk ring stain that I cannot get off! Before I found this page I tried a few tricks that I found online but none of them worked and I'm scared to try any more for fear of rubbing off the paint. I tried dish soap, Murphy's Oil Soap, damp rag, etc. Cheryl here.... oh that is tragic. I would contact the Society of Decorative Painters http://www.decorativepainters.org/index.php and use their contact form. 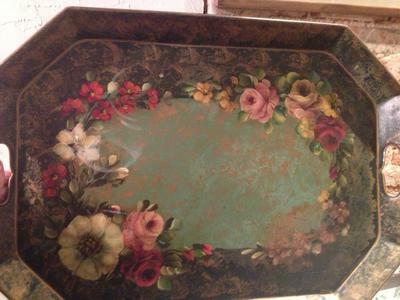 They would have experts on hand or at least leads who could help you restore the tray. I'm sorry I don't have an immediate answer for you.